I’ve been meaning to write a post on burgers for some time, but a recent visit to Blanc Burgers + Bottles has finally gotten the process rolling. Kansas City seems like a pretty good burger town. Town Topic has been covered here. Winstead’s is a local chain reminiscent of Steak and Shake (diner theme, fast food table service), which has apparently seen better days but still puts out a more than acceptable product. The aforementioned Blanc, along with a place called ChefBurger, are two recently opened “gourmet” burger eateries, although they are quite different in style. Uh, and in quality. The burgers at Blanc are thick, juicy bar burgers, probably ½ pound or so. The bottles refer to the large collection (100+) of beers and specialty sodas. No beers on tap, but the bottle selection is pretty good. They also have a list of specialty cocktails of uncertain quality, but they take seem as if they take them seriously anyway. The four of us at our table all ordered different burgers—a classic, a burger au poivre, an “inside-out” burger stuffed with a ball of blue cheese, and a buffalo burger. Besides me, who ordered the classic, everyone’s own was their favorite, and mine was excellent. I like baseline measurements so I ordered a basic cheeseburger. Probably the best I’ve had in town. It came out medium rare as requested, the beef was obviously fresh, the buns were terrific, from a local bakery. I couldn’t ask for anything more in a burger. 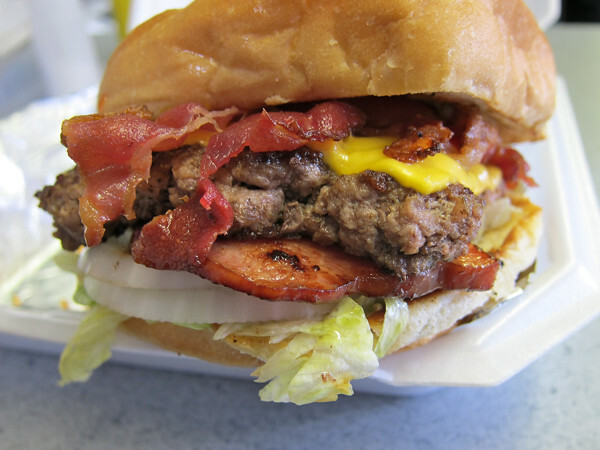 The blue cheese burger, with bacon, was decadent…a gooey, delicious, mess. The peppercorn burger was nice twist. The buffalo should have been cooked rarer (though it wasn’t ordered thus), but still tasted great. I wasn’t eating with people who are food-weird and would typically pass around all our food for sampling, but all four burgers got passed around the table. The fries, ordered a la carte, are terrific also—fresh cut, fresh fried. You have the option of regular fries, parmesan truffle fries, and sweet potato fries. All are excellent. I like ketchup on fries, and homemade ketchups aren’t usually much added value for me, but they deliver one here that is quite satisfying. Rich and unique, but not so novel that it makes one miss Heinz—a rare feat in my opinion. There’s also a chipotle aioli and homemade mustard that accompany. The fries come in little paper lined shopping carts, which are cute and impressive to people who like cute. The restaurant is largely white (blanc), contemporary décor, with chairs more comfortable than they appear. Oh, and pickles, also made in-house, are excellent. In any event, I was fully prepared to find this place overhyped and overpriced, but I really enjoyed it, and the best burger I’ve had in quite some time. So, Blanc’s competition in the fancy burger space in KC is a place called ChefBurger. ChefBurger is a locally-owned entry in KC’s new downtown Cordish-built chain entertainment development, the Power and Light District. There are a number of “concepts” new to the area, some new to the country, that populate the P&L Districts, and while it’s nice to have one locally-owned, it still comes off as more “concept” than restaurant. Of course, that’s the case with Chef Rob Dalzell’s other establishments too. 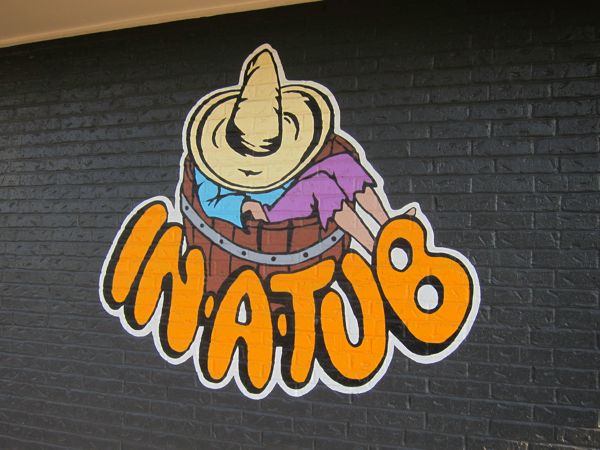 Based on these other establishments, I came in pretty biased against the place, so much so that I determined to give it at least three chances before writing about it. Blanc raised the bar, and I’ve only been twice, but I’m pretty sure that’s enough. My first visit to ChefBurger was pretty poor. I didn’t start with a classic, but rather the BLFGT Burger (Bacon Lettuce Fried Green Tomato). I ordered it medium rare, with a side of regular fries. The burger was completely rare, kind of gross, in such a way that can only happen with a frozen patty. The patties are thin enough that a warmer patty would have cooked partially in the middle in the time require to griddle the outside. The toppings (thankfully I guess, considering the poor burger) really overwhelmed the meet. An unwieldy chunk of iceberg lettuce, a thick cut fried green tomato. The whole thing was difficult to eat, not very goot, and at $6.99 in a fast food setting with no fries or drink, a rip-off. Even moreso with the fries, which were straight from a freezer bag quality or worse for an additional $2-3. The value equation is not insignificant here, esp. compared to the full-service Blanc (or any full-service restaurant). This is a fast-food set-up all the way. 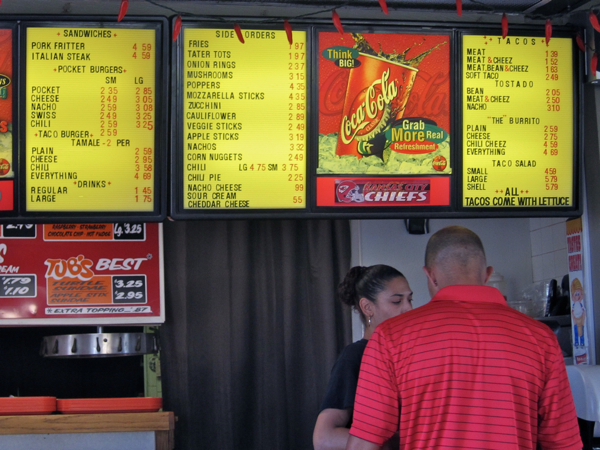 Stand in a long line (at lunch anyway), place your order, wait until they call your name, go to the counter and pick it up. Plastic cups, plastic silverware—no “restaurant” furnishings here. The concept is gourmet fast food, which is a fine concept if it delivers, but when the food isn’t that great, well, the price is more of an issue. The second visit was considerably better, but still didn’t really win me over. I ordered a regular cheeseburger ($4.99), no special cooking instructions, and it was a good fast-food burger. No In-n-Out or Fatburger, but probably on par with Steak and Shake, maybe better (it’s been a while). Probably better bun and cheese. And when you compare it to the quality of food and experience at Blanc—well, I don’t see a third trip to ChefBurger in my near future. Well, you're right Aaron. One would think that Kansas City would be ripe with good burger joints. My experience is that "good" in KC is too often associated with how many styles or fancy fixins' are available and totally ignore the fact that they're piling all that stuff on plain ol' big, frozen, disgustingly textured patties of questionable content. I'll have to mosey over to Westport and try Blanc's sometime in the near future. The P&L Dist. is not a favored destination for me, so I'll probably pass on ChefBurger. Since the demise of Max's Auto Diner on Wornall, (still there, but under new management and now advertizing Gyros as well) there just isn't a decent burger in the central corridor anymore. Now days I have to drive 25 minutes when the burger bug bites. 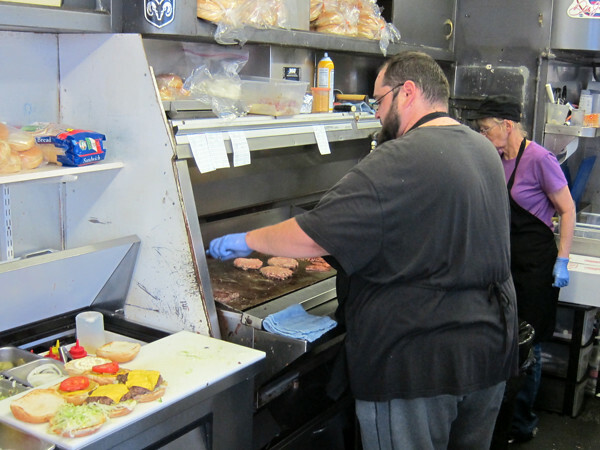 Number one spot these days is Grandstand Burgers in Merriam, KS, right at the corner of Antioch and Merriam. It's a take-out stand with three or four stools jammed into one end of of the little 50's former diner. There must be about 20sq ft. of floor space for customers, forcing an almost ritual shuffling of bodies everytime another customer has to move from the counter to the self-serve soft drink machine and back. Everyone seems to be pretty good natured about it. I guess it's because they know they payoff is worth sacrificing a little elbow room for. 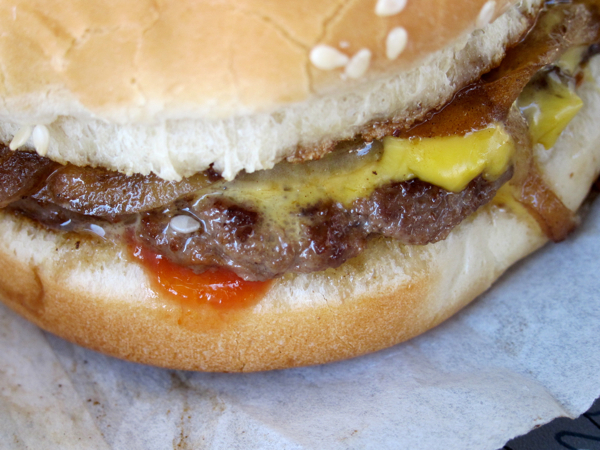 The burgers are a medium-thick style and the patties are smashed to order from pre-rolled and weighed balls of hamburger. I have not asked directly, but I am lead to believe the meat is never frozen. The flavor certainly lends credence to the story. Buns are toasted on the grill, first on the grill itself and then on the burger as it finishes cooking. Standard dress is mustard, mayo, ketchup, pickle, onion (fresh), lettuce, and tomato. Cheese (American) is of course available, as are bacon and ham. Doubles are availabe and they feature the "Kelly Burger", which is a double cheeseburger with one slice of ham and two slices of bacon. Never had one, but it looks to weigh in around 2/3-3/4lb total. They have the standard array of deep fried side dishes, fries, tots, oninon rings (frozen), mushrooms and mozarella sticks. I stick with the fries or tots, as nothing here really stands out. This place is about the meat - and it tastes good. Hey, thanks Doug! Glad you saved me a Grandstand write-up, much better than I'd have done. Grandstand is relatively close to me, and a very agreeable spot. Nice auto racing theme to boot. I also think that Westport Flea Market puts out a really good burger, which surprised me given how many times it's won Best Burger from varying publications. But they give you a nice thick bar burger, properly pink on the insides, McGonigle's (local butcher) meat. Now, they have a "toppings bar" that adds little to the experience in terms of flavor or atmosphere, but I thought the burger was excellent. The "flea market" refers to a bunch of actual flea market booths surrounding the sports bar-style restaurant, but I believe they be doing away with the flea market portion and bringing in a comedy club or some such. A couple other places I've heard good things about are LC's up north (no relation to the BBQ joint) and Big Bam in Shawnee (not all that far from Grandstand). A good friend from "the Northland" recommends L C's highly. I've yet to try them. Haven't had a Flea Market burger in 10 years or so. I'll have to go back now that I live on the MO side again. McGonigle's is my "second" grocery store. We're just down the street 10 blocks and around the corner a few more. Best steaks in KC. 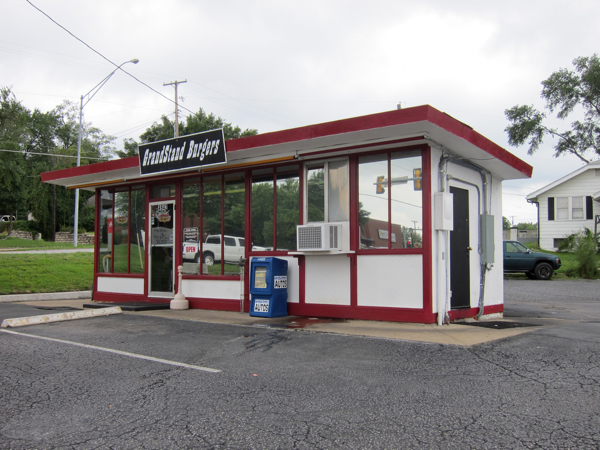 My favorite Northland burger joint is Hayes Hamburgers and Chili on North Antioch and Vivion Road. Classic sliders and greasy spoon chili - with or without beans. I usually ask for extra crackers to help absorb all the red grease. Gives me heartburn thinking about it, but man I love that place. The sliders are second only to the Cozy Inn in Salina, KS. If I specifically am seeking a burger, Blanc in Westport is the only place I'd go. Everything else is typical B&G, except Chefburger which is still not up to par for gourmet burgers. DougT wrote: My favorite Northland burger joint is Hayes Hamburgers and Chili on North Antioch and Vivion Road. Classic sliders and greasy spoon chili - with or without beans. I usually ask for extra crackers to help absorb all the red grease. Gives me heartburn thinking about it, but man I love that place. The sliders are second only to the Cozy Inn in Salina, KS. I'll second the Hayes recommendation. I've been there with Doug. they turn out a really fine version of the 30's style burger, plus the chili is good, too. 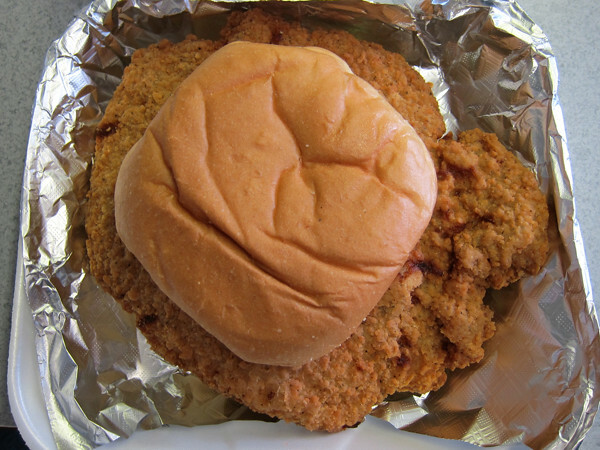 Another place I forgot to add is Jerry's Woodsweather Cafe, which is also known in KC for their burgers, though perhaps better on LTH for their pork tenderloin sandwich (and here's the content on Davydd's blog). The burger here was good, not great. They're huge, but cooked all the way through, which is okay with the 30s style, but a burger this big really suffers from being well done. The meat seems fresh, though, and there's definitely potential if they'll cook the burger medium rare and you can find someone to split it with. Anyway, the place is a total step back into blue collar, small town diner-land. Great long bar, smoke filling the air of at least one room, and lots of locals eating huge plates of food. I must confess, the tenderloin didn't impress me like it did Davydd, but I realize, maybe I'm just not that big a fan of pork tenderloin sandwiches. It did seem like a good version for what it was. Fries were excellent, clearly fresh. We didn't have room for pie, but it looked wonderful. A big ol' case of homemade desserts, in fact. Fried mushrooms were also excellent, and an enormous portion. And here's a comment on Jerry's for breakfast. 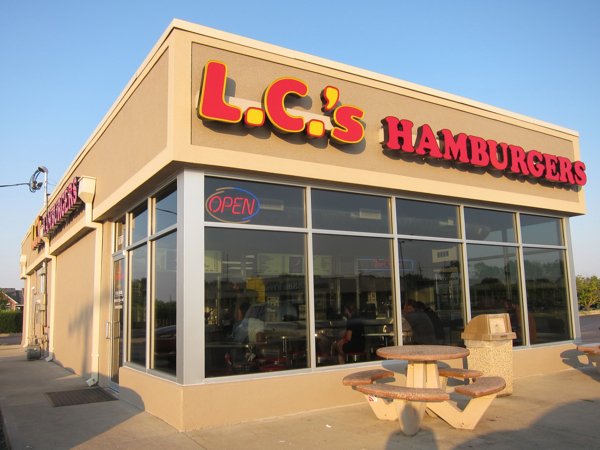 I finally made it to LC's Hamburgers, mentioned upthread, this past weekend on a trip back from Omaha. Not a whole lot to say, but a really good burger, in the diner-style, but with a nice, full enough but not too big sesame-seed bun. Patty was fairly thin, grilled onions standard--between the bottom bun and bottom of the burger, which I found interesting. Mustard and ketchup are also standard, with tomato and pickle by request (which I did). Signs indicated the burgers would be cooked to order. I didn't specify, and mine came cooked through, but the whole concoction remained juicy. The burger was $3, which was a fair price. The burger itself was better than ChefBurger, though you don't have access to gourmet fixings at a place like this, obviously. I liked the offering of a small, kids size burger for a buck, and so did my kids, who declared this the best burger place in KC...or maybe just below Streetcar Named Desire, which is abominable, located in the Crown Center food mall. The joint is cute, very small, just the counter waiting room really, in which they manage to fit about 4-5 tables with stools, all fixed to the ground. I don't see myself driving 20 minutes to satisfy an LC's fix, though I do prefer it to the much closer Town Topic, but it's a great option up north where I don't necessarily have a ready list of go-to places. Oh the poor Streetcar. Took a great, dark, cozy little bar that served a pretty good burger (smeared with cheddar cheese stuff and grilled onions) and completely ruined it by moving it into a food court in the bottom of the Hallmark shrine to the shopping mall - Crown Center Shops. It didn't survive the transplant in any appreciable way. Thanks for the LC's write up. I'll have to give it try next time I'm up north. DougT wrote: Now days I have to drive 25 minutes when the burger bug bites. 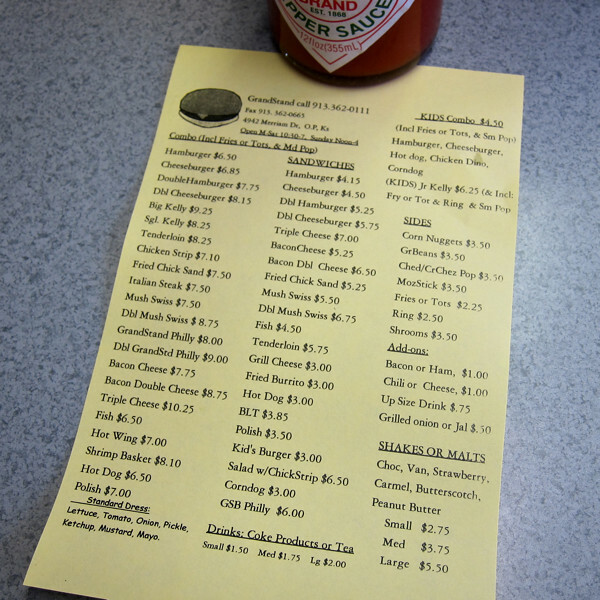 Number one spot these days is Grandstand Burgers in Merriam, KS, right at the corner of Antioch and Merriam. It's a take-out stand with three or four stools jammed into one end of of the little 50's former diner. There must be about 20sq ft. of floor space for customers, forcing an almost ritual shuffling of bodies everytime another customer has to move from the counter to the self-serve soft drink machine and back. Everyone seems to be pretty good natured about it. I guess it's because they know they payoff is worth sacrificing a little elbow room for. GrandStand is a tiny place that puts out some exemplary greasy food. 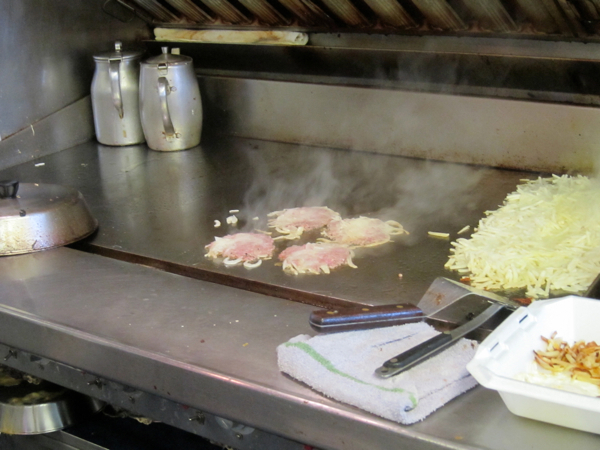 The griddle was going nonstop the whole time we were there and it was obvious the food is prepared with care. Their breaded pork tenderloin is quite good. I like its proportions—thick enough that you know you're eating a slab of pig, big enough that you don't feel cheated, yet not absurdly overhanging its bun. But GrandStand is known mostly for their burgers. Their signature Kelly Burger has bacon and cheese on top and ham underneath (that's the Single Kelly; a double patty Big Kelly is also available). I'm not sure how much those extra ingredients improve a burger that's excellent to begin with. Don't get me wrong, I'd rarely turn down a Kelly but I think at GrandStand simpler might be better. Consider this cheeseburger with grilled onions. Calvin Trillin was right: Kansas City has some good burgers. Which reminds me, is Winstead's still worth a visit? Last edited by Rene G on March 20th, 2016, 11:08 pm, edited 1 time in total. Let me reply to Rene G's question about Winstead's. It varies by location. The one on the plaza is still good for 30's style burger. It doesn't seem as good as it used to though, they don't seem like they are trying anymore. The one in Merriam is dismal, the burgers are all hard brown hockey pucks. It is the one closest to me but why would I even consider it when Grandstand or Big Bams are so close. By the way, LC's is closed due to a fire. They plan to rebuild and reopen late in the fall, last I heard. wesuilmo wrote: By the way, LC's is closed due to a fire. They plan to rebuild and reopen late in the fall, last I heard. Just to be sure, you're talking about LC's Hamburgers, mentioned earlier in this thread, that suffered a fire in June, right? LC's Bar-B-Q is open as usual, correct? Thanks for the Winstead's update. I had hoped to visit last month but GrandStand temporarily took me out of the game. It's still on my list for next trip. Yes LC's burgers. I just checked, as of Jul 19, they still did not have a projected opening date. they were complaining about new city regs. Rene G wrote: Calvin Trillin was right: Kansas City has some good burgers. Which reminds me, is Winstead's still worth a visit? wesuilmo wrote: Let me reply to Rene G's question about Winstead's. It varies by location. The one on the plaza is still good for 30's style burger. It doesn't seem as good as it used to though, they don't seem like they are trying anymore. My interest in Kansas City burgers—in regional American food really—was sparked by reading Calvin Trillin in the New Yorker decades ago. 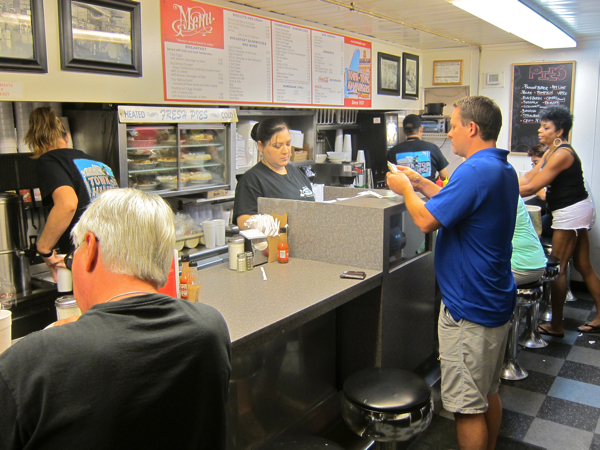 In previous visits, I'd done the obligatory barbecue tours, but at last it was time for my burger pilgrimage. With four hours set aside to eat, I'd finally get a chance to visit some classic places I’d long dreamt of trying. No new ground was turned. Our first burger destination was LC's, on the northwest side of the city, but before that we detoured to In-A-Tub, a mere half mile away. It had to be done. I don't know a lot about KC chow, but In-A-Tub's tacos seem like one of the city's most polarizing foods. You either love 'em or hate 'em. For me, hate is too strong a word. 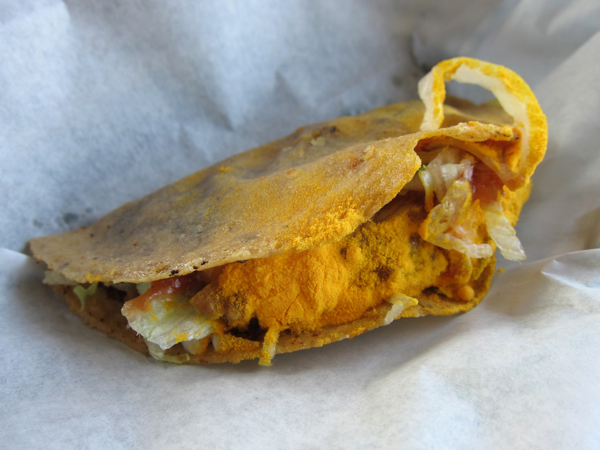 That's a "meat & cheez taco." I fully understand why that orange powder isn't called cheese, but why not specify what animal the meat comes from? I guess for thematic consistency I should’ve gotten a pocket burger, but I just wasn’t in the mood for a loosemeat sandwich. LC’s Hamburgers is a relative newcomer (1973) that's well regarded by the locals. The place was knocked out by a fire a couple years ago and took about nine months to reopen. I’d be surprised if they're not back to top form. 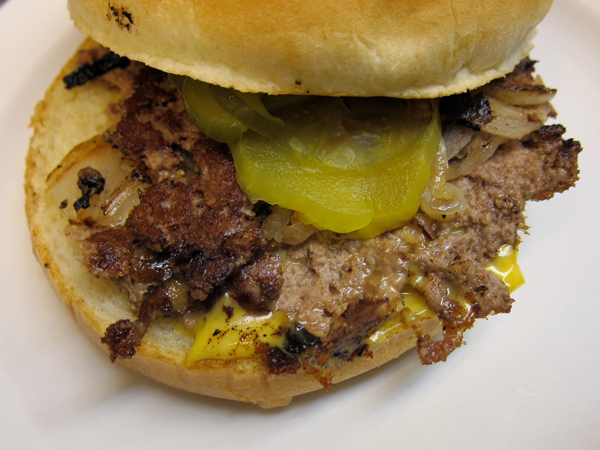 Nothing fancy with this cheeseburger—no bacon, no egg, no housemade condiments—just a medium-thick, griddled, pleasantly greasy patty with great grilled onions, American cheese and the standard condiments. Classic. It makes you wonder why five-dollar burgers this good are so hard to find. 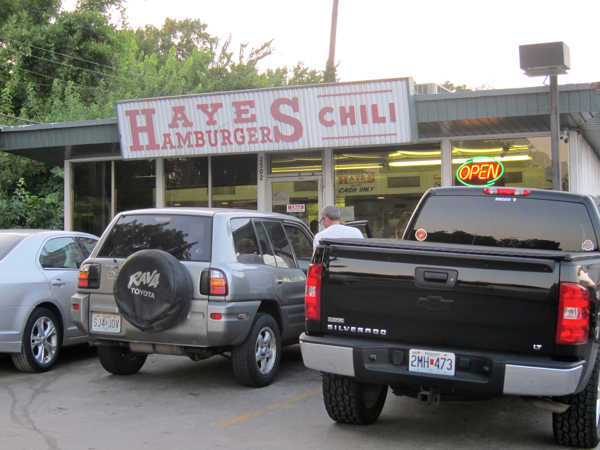 Continuing south, our next stop was Hayes Hamburgers, an atmospheric slider slinger in business since 1955. You'll notice chili prominent on their sign. 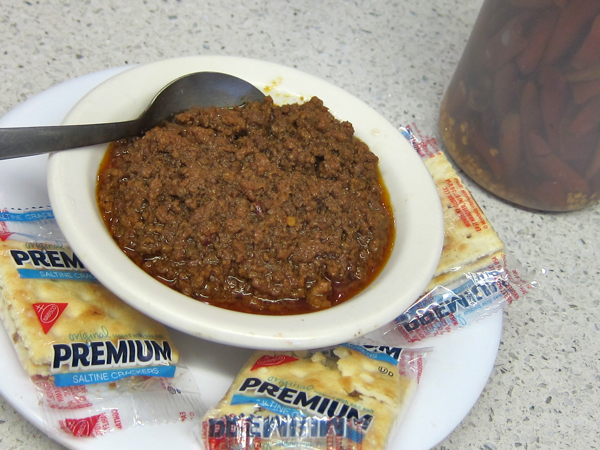 It's a good KC-style bowl—some beans on the bottom (separately cooked and optional) covered with finely ground beef in a sauce of red grease. A squirt of that pepper vinegar helps immensely. Actually pretty good if you're in the mood for something greezy. Burgers are firmly in slider territory, though larger and meatier than most. 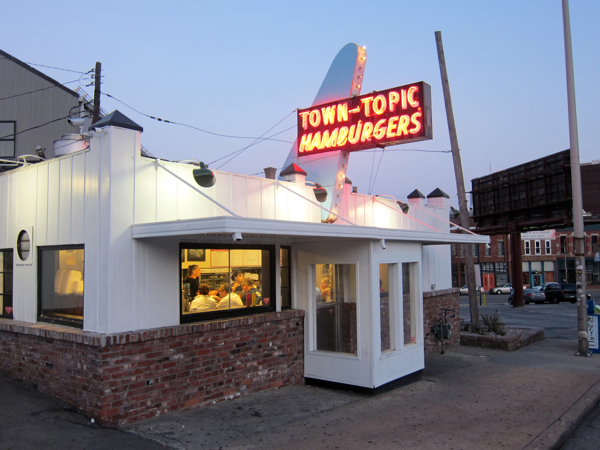 Town Topic is yet another classic KC burger destination. How great is that? More restaurants should have fins. Town Topic's burger is certainly slider-esque, but the meat is well seared (not half steamed) with nicely crisped edges. I liked this burger a lot. When I visit a place for the first time, I tend to order the specialty in "the usual" or most basic form. That meant single burgers with the standard condiments at LC's, Hayes and Town Topic. Finally, it dawned on me that doubles might be the way to go at Hayes and Town Topic (LC's basic burger is pretty well balanced as is). The small patties get somewhat overwhelmed by the buns. 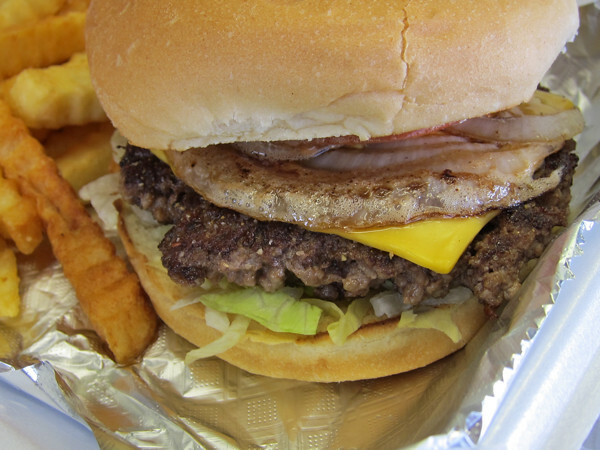 Town Topic offers, in addition to doubles and triples, a "Bigger Burger" that could be worth exploring. It was actually good we limited ourselves to singles, because by the time we made it to Winstead's, our southernmost and final destination, burger enthusiasm had waned a bit. We split a single from the drive-thru and called it a night. 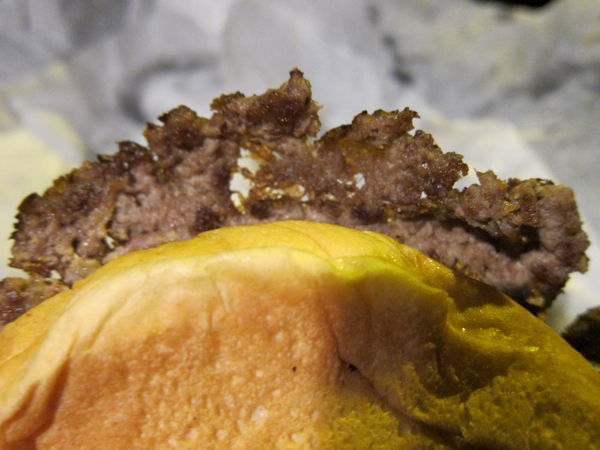 Awful photos, I know, but at least one of them shows the burger's beautiful crisp, lacey edges. I had heard widely divergent opinions about the current state of Winstead's, so I was very pleasantly surprised. 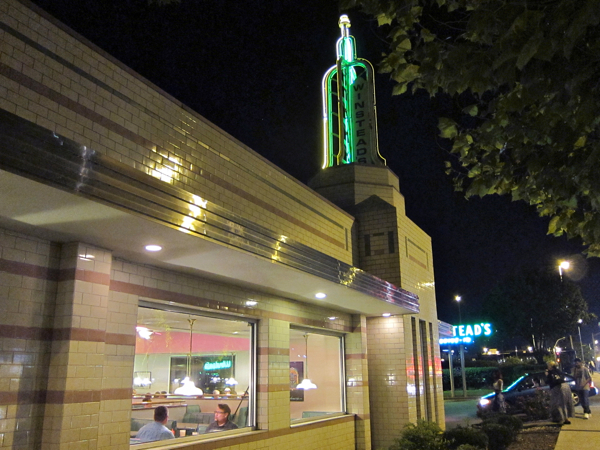 Next time In Kansas City I hope to make Winstead's my first stop to evaluate it more fairly. This limited sampling, together with GrandStand on a previous trip, makes it clear there are plenty of good burgers in Kansas City. Maybe better than in my hometown. Aaron Deacon wrote: I also think that Westport Flea Market puts out a really good burger, which surprised me given how many times it's won Best Burger from varying publications. But they give you a nice thick bar burger, properly pink on the insides, McGonigle's (local butcher) meat. Now, they have a "toppings bar" that adds little to the experience in terms of flavor or atmosphere, but I thought the burger was excellent. REALLY enjoyed my burger at Westport Flea Market this past weekend. 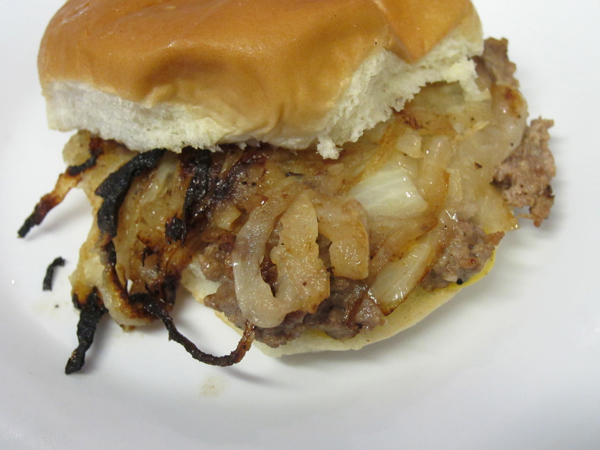 Big thick flavorful patty cooked to a perfect medium rare, tasty sauteed onions & mushroom as well. Curly fries are forgettable but come up a notch with addition of the BBQ sauce. Side tip, They supposedly open at 11am, so if like me you arrive 11:15 and they aren't open yet, go in the door by the patio which is where the employees walk in. They were ready for business, just hadn't unlocked the doors yet.